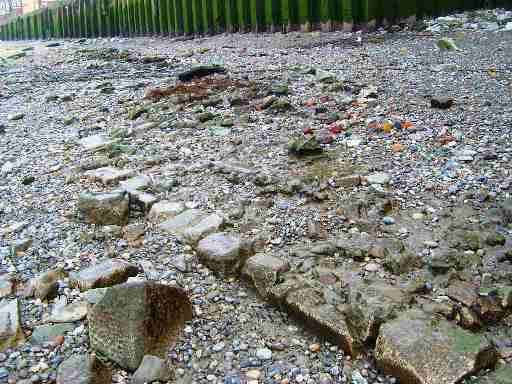 In March we were at Rotherhithe again; this time there was an exceptionally low tide which revealed even greater evidence of erosion and some new features. The downstream section of the site was quite muddy but we did manage to distinguish an old ‘friend,’ which we hadn’t seen for a while. This is a strange wooden construction, rather like a small door frame in shape, has no obvious use apart from the possibility that it is some kind of ‘mooring feature.’ There are a great many of these unattributable pieces of wood on this stretch of foreshore which, given the nature of the area, which was important for ship breaking in the 19th century, were almost certainly used to moor various watercraft whilst waiting for the action of the tide to gradually break the ship. 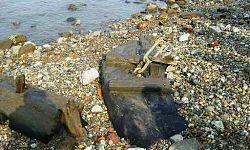 Elliott accompanied us on this visit and pointed out a number of individual timbers which he identified as coming from particular ships which had been broken up on the foreshore. 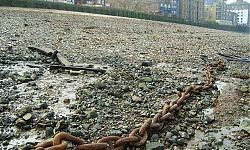 The amount of shipbreaking that occurred here must have been considerable judging by the numerous metal scatters of nails and discarded tools that are still visible in large quantities. 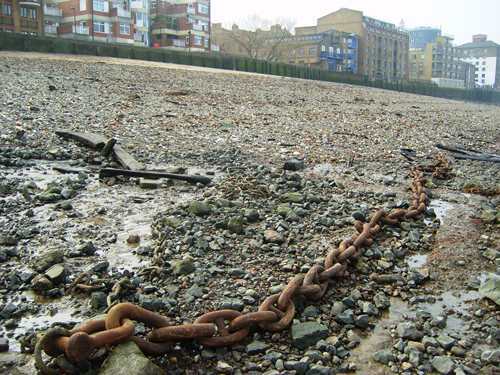 A very large chain was clearly revealed and we were surprised that we hadn’t seen it previously but this is probably explained by the unusually low tide and the ongoing erosion. 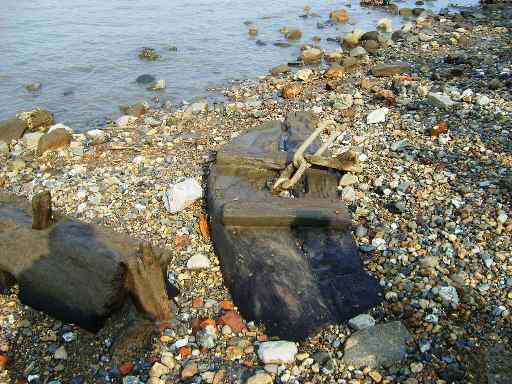 We have seen several metal objects, particularly anchors come and go. Although they might appear to be too heavy to just float away they might, unfortunately, be attractive to those interested in scrap metal. For some time we have been intrigued by small green metal pellets which we found in one particular area but we could not identify them apart from learning that they were probably some kind of oxidised copper waste. We are not sure where this might be from but on this visit we couldn’t find any trace of them, instead we found some larger, pieces of oxidised metal, again their purpose and origin are mysterious. 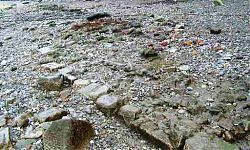 A line of stone paving which we had previously photographed but not identified is now clearer as a result of erosion but its function is still debateable, possibly the edge of a revetment? We also saw an area of bricks, obviously deliberately arranged, but why? And then there was the patch of metal pieces which also seemed to have served some sort of purpose, but what? This visit certainly raised more questions than answers but this is one reason why monitoring does not become boring and repetitious. Perhaps future visits will provide more bits of the jigsaw but it’s just as likely that more puzzles will present themselves.